HENNY HUGHES (USA) (Chestnut 2003-Stud 2007). 6 wins-3 at 2, Saratoga King's Bishop S., Gr.1. Sire of 720 rnrs, 469 wnrs, 32 SW, inc. Beholder (Breeders' Cup Distaff, Gr.1), Asia Express, Moanin, Merry Meadow, Academic, Keiai Leone, Henny Hound, Jordan's Henny, I'm a Looker, Chitu, Honey Hues, She Digs Me, Don Fortis, Henny Jenney, Princess Valeria, Hughsy, King Henny, The Star of Geely, Brookerson, Myfourchix, Shenandoah Queen, Thetrailerguy, etc. My Halo Rocks (g. by Henny Hughes). Winner. See below. Sanso Tank. 3 wins from 1000m to 1800m in Korea. Scorpion Prince. 2 wins at 1400m, 3d ATC Diona Civil Engineering Contracting H.
Around the Moon. 7 wins-2 at 2-from 1000m to 1600m to 2017-18 in Aust. Jaya. Winner at 1200m in Aust. Zarada Angel. 4 wins at 1200m, 1400m in Aust. MY HALO BROKE (Don't Say Halo). 7 wins. See above. Palace Ruler. 2 wins at 1550m, AJC Electro H., STC Campbellfield H., 2d AJC WC Wentworth H., SAJC Springhill Lad H., Stanley's H., 3d AJC Arctic Symbol H., Sadlier H., STC Telopea H., Art Gallery H.
Mountain Haze. 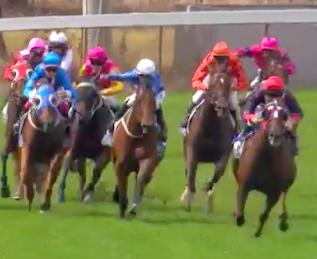 4 wins-2 at 2-to 1500m, A$199,600, WATC Westspeed 3YO H., Westspeed Nursery H., Westspeed H., Westspeed 2YO P., 2d WATC ABN'zing Race H., Golden River Developments H., 3d WATC Westspeed Nursery H., Del Basso Importers & Exporters 2YO H., Magic Millions Perth Yearling Sale 2YO P.
Occhilupo. 2 wins at 1300m, 1500m in Aust. Krayzelburg. 8 wins from 1200m to 1800m, A$175,275, MRC Champions Club H., Morse Code H., Journal H., MVRC Sydney Entertainment Centre H., 2d MRC Shrine of Remembrance 70th Anniversay H., VRC Peter Rowland at Flemington H., Heaven H., 3d Mornington RC RM Ansett Classic, MVRC Cameron Kennedy H.
Trackball. 4 wins to 1300m, AJC Bill Hall Real Estate H., 2d AJC Michael Cleary H., Croydon H., STC Mounties H.
Broker John. 3 wins from 6½f to 9f in U.S.A.
Hawaiian Brave. 3 wins at 1m, 8½f in U.S.A, 2d Longchamp Prix de la Lorie, Prix de la Faisanderie, 3d Longchamp Prix de la Cascade. Producer. Chimes Rebel. 2 wins at 8½f, 11f in Canada. MORPHY (Geiger Counter). 8 wins from 1250m to 2400m, A$214,101, S$97,191, STC Frank Underwood Cup, L, BTC Lord Mayor's Cup, QTC CEB Barnes P., Singapore TC Class 1 H., AJC Carnarvon H., QTC Sir William Mack H., STC Buckpasser H., Prince Camillo H., 2d Queensland Cup, L, QTC Ramsay Health Care H., L, BTC Marscay H., STC Realestate.com.au Welter H., VRC Life's a Party Catering H., 3d STC Ajax S., Gr.3, QTC Fuji Xerox H., Singapore TC Class 1 H., STC Springwood 2YO H.
Night Life (Highest Honor). 5 wins from 1600m to 1900m, Longchamp Prix du Roule, Saint-Cloud Prix de l'Hudson River, Santa Anita Allowance, 2d Santa Anita Exceller H., L, Chantilly Prix du Tombray, 3d Bay Meadows Foster City H., L, 4th Hollywood Park Jim Murray Memorial H., L.
Race Record: 13 Starts 1-2-0 A$20,556. Winner at 1300m in 2016-17 in Aust.